The lease of our offices is up for renewal in March and I have been informed by the management company that the rent would increase by 12% which is really high given the economic climates so I’m now searching for new, inspiring, affordable offices in West London to keep our options open. It’s a real shame because we have been very happy in our current offices. We are blessed with a huge amount of natural light and our unit has great white brick walls, NYC loft style…. For having operated from ‘not so inspiring’ premises in the first years of the business, I know how important it is for the spirit and the well-being of your team (and yourself!!) to have a nice, working environment so I’m on a mission to find a workspace that will feel like home. If you hear of anything, office/light industrial spaces available or large spaces at ground level (for deliveries), forgotten shops that we could turn into a concept store, let me know…. We are after 850 sq ft which we could divide in stockroom & offices or a large open plan but nice like the one we currently have. 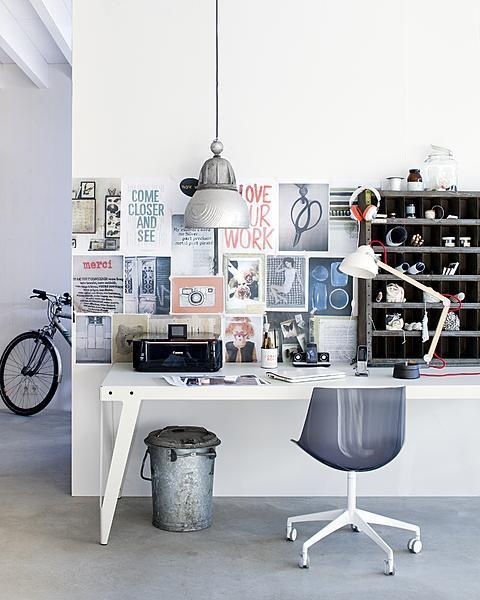 In the meantime, here are some really nice offices I wouldn’t mind working from. i love all the workspaces!So inspired post! I have a home office too and it is so important to find the right space with the right ambience, and for me it’s lots of natural light. Very inspired by your photos. My office is white to reflect light with light wood flooring. The long desk looks like a very communal studio space I wish I had the room for! Office design is important for the work flow, but I think you were right with the pink folders, you need some color around you to get inspiration! These are all good choices for office designs. The long table offers a professional meeting space. Good luck with choosing your look. I love Jacqueline Morabito workspace and also her attention to white detail when it comes to her clothes and even her iPhone. I wonder how it would look if she came to work wearing black !! Previous PostGood things to come your way….